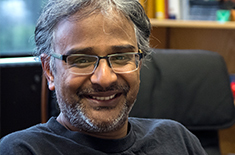 School of Computing professor Suresh Venkatasubramanian has been appointed a council member of the Computing Community Consortium (CCC). The CCC Council is comprised of 20 members who have expertise in diverse areas of computing. They are instrumental in leading CCC’s visioning programs, which help catalyze and enable ideas for future computing research. Members serve staggered three-year terms that rotate every July. “I’m really honored and excited to join the CCC. They do a fantastic job in outlining forward-thinking agendas for computer science and doing the hard work to help researchers push this directions forward. I’m looking forward to helping the CCC build on their ongoing efforts in fairness, accountability, transparency and ethics in automated decision-making,” said Venkatasubramanian. The goal of the Computing Community Consortium (CCC) is to catalyze the computing research community to debate longer range, more audacious research challenges; to build consensus around research visions; to evolve the most promising visions toward clearly defined initiatives; and to work with the funding organizations to move challenges and visions toward funding initiatives. The purpose of this blog is to provide a more immediate, online mechanism for dissemination of visioning concepts and community discussion/debate about them.